I really don’t play abstract strategy games. I have a few, but they rarely hold my attention more than a few weeks after I purchase them. I know how to move each of the pieces in Chess, but never cared to play it enough to figure out any kind of strategy. The same could be said for Checkers – such an easy game in comparison, yet I’d lose to any 8-year-old I’d play against. But I was pretty hopeful that Hive would be different, so I purchased it shortly after its appearance in our weekly Explorable Favorites last November. Is this the abstract strategy game that will finally hold my attention? The game is ready to go immediately upon opening, and the rulebook can be devoured in under 15 minutes. It is so easy to get Hive to the table. No board to set up. No cards or cardboard bits to prepare. Just two mirrored sets of 11 oversized domino-style pieces to separate and you’re off. Even if you and your opponent are prone to analysis paralysis, it’s unlikely a game of Hive will reach the advertised 30 minutes – my games tend to last around 20 minutes. You will be able to teach Hive to a new player in under 10 minutes. Then you will be able to destroy them. While the rules learning curve is next to nothing, the strategy learning curve is quite steep. Like Chess, it will take you dozens of games to start seeing all the possibilities and planning for moves 10 turns in advance. Several of the people I play games with won’t play Hive with me. For some it’s the complete lack of story inherent to abstract strategy games that turns them off; for others, it’s not wanting to feel stupid. This is by far the greatest setback of games like this… unless you’ve played the game less than your opponent has, it’s pretty hard not to feel mentally inferior if you lose (particularly if you lose handily). There is absolutely no luck involved, and the only variables are experience and skill. I have one person I regularly play this with and one other who will occasionally play with me. Everybody else gave it a shot but prefer anything else. Hive is objection-free. There is also no reading involved, and I see no reason why this couldn’t be offered as a Checkers alternative to a 6-year-old. You would need to try to lose to keep them interested, though. Chess is a really good comparison for Hive. They both focus on unique movement between the piece types (Hive has 5 unique pieces (up to 8 with expansions) compared to Chess’s 6) and capturing your opponent’s King/Queen Bee. The principal differences are the lack of board and “outward” approach in Hive (in Chess you start on the outskirts and move in; with Hive each player starts with a piece touching their opponent’s and branches out from there). I have a STRONG preference for Hive over Chess. This may be because Hive isn’t many centuries old, so there’s far fewer players out there that can make me feel like an idiot. It’s certainly due to the drastically lower playing time. And I probably like bugs more than medieval-type stuff. Another game that is likely quite similar to Hive is Arimaa. One abstract strategy game is enough for me, but if and when I want another one Arimaa may be it (I think it’s out of print, so there will be some mark-up to track it down). While it doesn’t make me want to rush out and expand my selection of strategy games, I am very happy to have Hive in my collection. It is outstanding fun, and gives you a great opportunity to flex a little brain muscle. It’s also quite easy to knock out 3 or 4 games on those low-key two-player nights. I would definitely recommend that experienced players try not to win when playing with less-experienced players lest you run them off like I did. Let them get up to speed and confident before you hammer them. Up until roughly a week ago I had next to zero 2 player only games in my collection. Even though the girlfriend and I play more games just us than with company I don’t like the restriction of not being able to add more players. Between my lacking 2 player collection and not touching a chess piece in over 10 years I would have been the last person to pick up Hive. 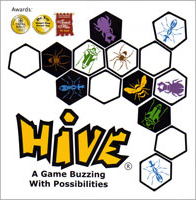 That was until I asked /r/boardgames for advice on a solid vacation game that was not simply a pocket / travel edition of an already mediocre game, I had seen Hive’s name mentioned dozens of times on various websites but always brushed it off due to the player limitation. Well I bought Hive and I am very disappointed, not at the game though but rather myself for dismissing it some 6 months ago without even giving it a try. Learning to play is simple, learning how to win will take practice. In the most simplistic explanation, you and your opponent will take turns placing and/or moving insects around the ‘Hive’ in a fight for dominance, in order to take control of the Hive and win, you must completely surround your opponent’s Bee using a combination of both players’ pieces. The setup occurs during the first 4 turns, these turns follow different rules from the rest of the game. Your first piece you play MUST touch your opponent’s piece. You MUST place your Bee within your first 4 moves. After the “setup” phase you will have to choose between placing a new piece and moving an insect already in play. First I will cover the placement of new pieces. When placing a new piece regardless of which Bug it is, you can ONLY touch your colour piece. To make things clear / reiterate you cannot place a new tile so that it is touching both colours. When your Beetle is on top of an opponent’s bug, that tile is considered yours and you can place pieces off of it so long as they do not touch any of your opponent’s pieces. This is where the majority of the strategy comes in, each bug moves along a set path similar to chess piece (although with much more abstract paths) I will now explain how each bug works. note: At no point in time can you cause a separation that would split the tiles into more than 1 ‘hive’. Grasshopper: It hops! You can only move your grasshopper if it hops a piece next to it, the Grasshopper MUST move in a straight line, MUST hop over at least 1 piece and MUST fill the first available gap. Ant: These crawling insects work much like their real life counterparts and can move anywhere as long as they can get to that space by sliding along the table, without pushing other tiles out of its way or having to pick it up to fill a hole. Beetle: Beetles move only 1 space in any direction, however unlike any other bug they have the ability to move on top of other pieces. A piece with a Beetle on top of it cannot move and is considered to be the colour of the piece on top. Beetles can be stacked up to 4 high. Bee: Similar to the initial Beetle movement, your Bee can also only move 1 space, however this is all your bee can do, it possesses no special power. Spider: These 8 legged freaks MUST move in a single direction and MUST move 3 spaces. The components are one of the best parts about hive, the tiles are a perfect size and are heavy enough that they don’t push each other away as you move your pieces, the sturdy tiles make Hive perfect for outdoor play and the travel bag it comes with lets you take Hive anywhere. What makes Hive so enjoyable to me? Who would enjoy Hive and why? I think that Hive would do great with anyone who would consider playing a board game, obviously the limitation of only being a one on one game will be an impact on all categories, but when there are just two of you, Hive is perfect. Hive is often described as “chess with bugs.” I won’t lie, I’ve used that description with uninitiated players as well. It does borrow several game mechanics from chess. The different bug pieces all have individual rules that govern how they can move and the goal of the game is to trap the other queen bee of the other player. As far as strategy goes, the game is top notch. It seems that every time I come up with a new tactic for attacking my friend’s queen, he is able to figure out a way to counter my method within a game or two (and vice versa). This is a testament to just how balanced and well thought out the allowed movements for each piece type are. Nothing is “broken” here. Games typically last less than 20 minutes so it definitely invites playing several times in a row. One thing worth noting: A common rule variation states that the Queen cannot be placed on the first move. This will make more sense once you’ve fully learned the rules of the game. I’ve found that when playing without this rule a few too many games end in draws for my liking, so I’d definitely recommend using this variant after you get more familiar with the game. The game also comes with very nice, thick ,and sturdy pieces to play with as well as a nice zipper bag that is perfect for travel. Two expansions have been released: the lady bug and the mosquito. These are just two new bug types with their own movement patterns and do add quite a bit to the game. Because of this I would recommend buying the Hive Carbon edition, which includes these two expansions and generally does not cost much more than the original edition. The Carbon edition is also all black and white, as opposed to the multicolored pieces included in the original. I think these black and white pieces look much nicer but that’s just a personal preference so you may think otherwise. What’s not to like about this clever, 2p game? All in all, the game is a tile (‘bug’) laying/moving one; the goal is to ‘capture’ the enemy bee-queen. Each bug has specific rules for moving, and each bug moves around (or over) the main bug/tile structure (hive). The hex-tiles are of fine plastic material (feels like ivory tbh), highly resistant to any usual board-game dangers (stains, gravity, etc). Perfect for a quick play on the beach! Five to twenty minutes (at most). Just enough to tease you and get you to play 2-3 games more, in a row. The bits in this game are hefty bakelite hexagons, each one depicting a bug. There’s one bee, there are a few spiders, a few ants, a couple beetles, and so on, black ones for one player and white ones for the other player. On your turn you either lay one of your tiles down, connected to the rest of the other tiles, or you move one of the tiles already placed. Each piece moves in a different way: the spider moves three spaces, the grasshopper leaps over a row, straight in any direction, and so forth. There is no board; you just lay the tiles next to each other on whatever surface you’re using. The goal is to trap your opponent’s Queen Bee, the bee piece, surrounding it with your pieces and, perhaps, your opponent’s as well. The game is frequently compared to chess for good reason: there are sets of distinct pieces that move differently from each other and the game is *very* abstract. It has a few major advantages over chess, though, and I write these words as a chess player of many years. First, it plays very fast. There are only so many pieces in the bag and you go through them fairly quickly. My games normally last about 20 minutes, sometimes faster, sometimes not. Second, this game does not feel broken, like chess does. Chess is thrice plowed ground: between computers and centuries of learning, there just isn’t much unexplored territory. Third, this game is much more accessible for non gamers. Yes, there is still wonder and excitement and there is much to cherish about chess. And I still love it and play when I can. But in my little world of 2 player abstract games, this is normally #1 now. I can’t imagine ever turning down a game of Hive. It’s fast. It warms up my brain. The tiles are lovely. What’s not to love? Hive consists of a series of simple placement rules for a series of tiles with special movement abilities. You keep your queen from being surrounded while surrounding your opponent’s queen. The beauty of it is in how simple it is to teach (my 4-year-old has mastered the rules) and how much depth the game offers. My 6-year-old can play somewhat competitively, and we enjoy talking about strategy after our games together. I’d say 6 is a great age to introduce this thinky game, though younger kids would enjoy a gentle introduction as well. The bug theme helps. Overall, Hive is an inexpensive, durable abstract strategy game which appeals to all ages. When I first played Hive, I was a little overwhelmed with everything. I had no idea what was considered a good move and what was considered a bad move. Hive is a game that is completely strategy based, meaning that you are always assessing not only your moves, but your opponent’s moves as well. You always have to stay one step ahead of your opponent if you really want to win. While Hive isn’t my favorite game out there, I still feel like it is a great game for a variety of different reasons. One of the things that makes Hive such a wonderful game is that it takes up very little space and it can be played on any flat surface, making it a great travel game. Another thing I really like about Hive are the tiles themselves. 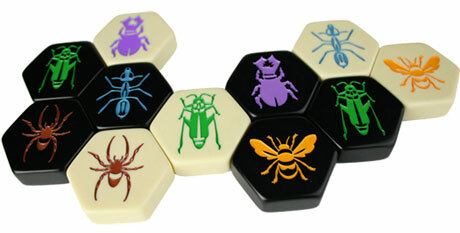 The pieces themselves are really durable, and the colorful insects inscribed on each tile are just really well designed. Also, Hive is really simple and easy to teach, but it also keeps players entertained from beginning to end, as they plan out their strategy that will hopefully make them victorious! In conclusion, Hive is small enough to play virtually anywhere, simple enough to teach to just about anyone, and fun to play. Personally I prefer games that have more elements to them than just strategy, but that is just my opinion. I would recommend Hive to anyone who loves strategy games, or is looking for a great game to play with their partner on the go! Hive is a really elegant abstract strategy game, and that is reflected mainly in the rules and the components. The rules are simple. On a turn you either place a new bug or you move an existing one. Once a player’s queen bee is completely surrounded, he loses. The thing is, you can’t break the hive. This means, moving a piece which would divide the board in two or more parts. This is the rule that makes the game. As the pieces move around the board will take a different shape and some will be trapped. This is where you realize you have attack and defend at the same time. The components are made of bakelite, which makes them very sturdy and pleasing to handle and make a cool sound when they bang together. Players are instantly engaged with these. There is a portable version, Hive Pocket, which I always carry with me because it’s easy to teach, games don’t drag on and there’s always a surface nearby. that is a nice game. there is 3 additional pieces : Ladybug , Mosquito & The Pillbug. The Ladybug moves three spaces; two on top of the Hive, then one down. It must move exactly two on top of the Hive and then move one down on its last move. It may not move around the outside of the Hive and may not end its movement on top of the Hive. Even though it cannot block by landing on top of other pieces like the Beetle, it can move into or out of surrounded spaces. It also has the advantage of being much faster. Any piece which physically moved (directly or by the pillbug) is rendered immobile on the next player’s turn; it cannot move or be moved, nor use its special ability. The mosquito can mimic either the movement or special ability of the pillbug, even when the pillbug it is touching has been rendered immobile by another pillbug. That is how this game was described to me. It’s the new, modern chess…and that description is correct. It’s even better than chess. There is a lot more strategy involved with how you play your tiles, and the added expansions serve to only make the game even more interesting. The games themselves are relatively quick (10-15 minutes on the long end) and you generally want to make sure that you’re playing with people that care enough to try and out-think you. I have found that once you get to know the way your opponent thinks about their approach to the game, you can start to interact with them on a different level, which adds another strategic element to the game. I am a pretty avid gamer, however my wife is not. She likes to play card games, maybe Yahtzee with the kids, and that’s about it normally. However, Hive is one game she will play again and again. Hive is an abstract tile laying/movement game, the purpose of which is to completely surround your opponent’s bee tile with other hexagonal bakelite tiles that have various bugs on them, and each bug has a different movement ability. There is no capturing involved, just placement and movement. My wife likes it because the rules are not complex, yet there is strategy there and she quickly got to a point where we were equally skillful at the game. I like this game because it is easy to teach to someone, and it can really get you thinking. You have to be careful not to let your own bee get surrounded while trying to maneuver your tiles to surround your opponent’s bee. You can pretty quickly get yourself in a spot if you’re too focussed on your opponent. The pieces are great, too – very solid bakelite pieces with vibrant colors for the bugs that are etched on them. I highly recommend Hive for a quick pick-up game, or for that gamer in your life who wants something they can sink their teeth into without having to memorize a lot of rules. A friend and I had an hour to spare, and out of the blue he surprised me with pulling this game out of his bag. And what a delightful surprise it was. The game is quick to play and easy to learn, but still involves the players in intense strategic thinking. This is a game well suited for newcomers as well as experienced players. With no board, this chess-like game requires no preparation, making it a well suited game for travelling. Hive is a nice little strategy game. The object is the capture your opponent’s queen bee with a wide array of assorted insects. Each insect has special movement abilities much like chess pieces. You move your pieces about trying to surround the opposing queen. Once surrounded, the game is over. The pieces are nice and hefty, and the bugs appeal to kids. The game comes with a nice zipper bag for carrying anywhere. It’s a quick game, so it makes a nice filler for a game night between games. I have the pocket version of Hive. It has the expansions included. The game is a 2 player game that can take about twenty minutes. I grew up playing chess and this is a smaller version that still gives you the chess live feeling. I can bring the game with me on trips and is easy enough to learn. I would recommend to strategy game players. The goal is to surround the players bee. Each bug moves differently like in chess. Hive is one of those games that is genius in it’s simplicity of design. Get a few hex blocks. Make up a few pieces that, similarly to chess, have easy to remember but unique movement rules. Set a goal of capturing the queen. Similarly to chess it falls into the “easy to learn, tough to master” category, and serious kudos to the designer for this one. I think that its a bit fitting that as I write this review, my eyes are looking for little ants that may be crawling on my desk. I absolutely hate ants, hate them beyond something words can describe. *Ahem* Anyway, we are talking about a different Hive. Hive is an abstract board game in which the objective is to surround the opponents Queen. This can be done with a combination of your pieces and the pieces of the opponent. Gameplay works by moving 1 piece of yours onto the playing field, and then later moving things to try and surround the Queen. I’ll be honest, this kind of game just doesn’t really appeal to me in the slightest bit. In general, I find most abstract board games to be rather dull and lifeless – with the possible difference being Go. Hive doesn’t do much to actually change this in general. Its nothing against the game so much as its just the type of game that I don’t tend to like too much. With that said, who would like this game? If you enjoy games like Go or Chess then you will definitely love this game. There is a lot of strategy to be had in this game if you want to sit down and work it out, I suppose. Most avid and casual gamers may possibly enjoy this game too, because its fairly easy to pick up and learn – and it doesn’t take an amazing amount of time to play either. Who won’t like it? That’s hard to say really – my immediate assumption is that gamers like myself, who just don’t like the more abstract board gaming feel, may not terribly like the game too much. Overall, I didn’t enjoy the game too much. Its more than likely due to me not liking abstract games much in general, but if you don’t like games like Chess or Go, then you may want to take a pass on this one – or just play a version that your friends have. I am not usually a huge fan of abstract games, but for some reason Hive hits all the right spots. The goal of the game is simple, surround the opponents queen bee. The execution is more complicated than it seems at first glance. Each game I play I see more depth to it. It will definitely appeal to people who like Chess or Go. It may also appeal to people like myself, who aren’t huge Chess fans. Hive starts out less overwhelming because there are fewer pieces and each turn you move a piece or place a piece. However, as you play there are always interesting choices to make. As a bonus since there is no board, the game consists of only tiles, the game does travel very well. This was one of the first games I had and it is still very loved. After four years of a heavy use, the pieces still look brand new and we are still loving every play. The game doesn’t use a board, so it is very portable and can be played on most surfaces, and the small bag, opposed to a box, makes it very easy to take anywhere. There’s not much to dislike about Hive: simple rules, cool abilities for the insects, great bakelite pieces, bugs…can’t get much better than that. Lots of strategy in there with great replayability. My wife is very competitive and when we pull this out in the evening we can find ourselves playing for much longer than we anticipated. The game mechanics are wonderful and interesting providing endless strategies. Add a Review for "Hive"